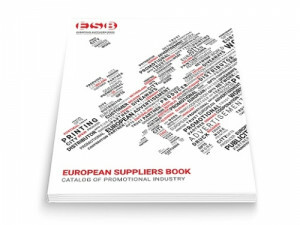 In September, the 6th printed edition of the European Suppliers Book will be delivered to the hands of professionals from five thousand companies across Europe. The recipient list include the visitors to the RemaDays Warsaw 2018 show. The ESB catalogue will be distributed digitally in the same month. The European Suppliers Book is a catalogue of suppliers from the advertising industry operating on the European market, which aims to support export activities as well as reach distributors and advertising agencies across Europe. Its aim is to give a chance to present one’s offer, build a database of companies in the advertising industry open to our customers, make it easier to search for companies with specific objects on the European market and inform about the latest offers on the market. The book is a tool both for advertising and getting contacts that can be used to develop one’s own business activity. Moreover, it is a tool for tracking emerging and disappearing trends, looking for inspiration and watching the latest directions of development of the advertising industry. The catalogue has been present on the European market for 6 years and enjoys increasing interest both among Polish and foreign companies.